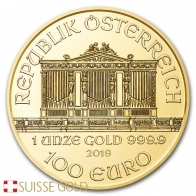 Austrian Philharmonic One Ounce Gold Bullion Coin. 50 Tubes of 10 coins each. Brand new 2019 issue 1 Oz Gold Philharmonics. Each coin contains one ounce of 99.99% pure investment grade gold bullion. The Philharmonic gold coin is produced by the Austrian Mint, and is the most popular item that they produce. The Gold Philharmonic coin comes in 1/10 oz, 1/4 oz, 1/2 oz and 1 ounce sizes. The gold Philharmonic was first introduced by the Austrian Mint in 1989. From 1989 to 2002, the coins had a Shilling face value. From 2002 on, the coin's denomination was changed to the Euro. The 2017 Gold Philharmonic coin has a face value of €100. 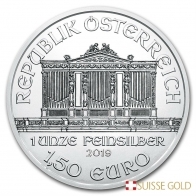 The Austrian Mint also produces a silver and a platinum Philharmonic coin. The front of the coin features an image of the famous Vienna Musikverein's Golden Hall's pipe organ. The front also features the coin's year, face value, and fineness. The reverse of the coin features a composite image of a number of the instruments used in the Vienna Philharmonic orchestra. Coins come in an plastic slip. Please contact us to sell gold Philharmonic coins.